We expect our bodies to do certain things—or at the very least, when some things occur, we’re not surprised by it. Such as the hair on our heads going gray or perhaps receding or maybe even falling out completely. But sometimes, the body will do something that you never thought was a possibility, like your eyelashes falling out. It’s not incredibly common and it’s probably not anything you’ve considered, but it does happen. It’s called madarosis. But what causes it? Are there symptoms that you can be on the lookout for? What do your eyelashes do for eye health, anyways? We’ll take a look at that and more as we explore madarosis. What Is the Role of Eyelashes in Eye Health? So, your eyelashes have started falling out. What does that mean? How much do your eyelashes contribute to your eye health? Eyelashes are the first in line in terms of defending your eyes from irritants and things that have the potential to damage. Eyelashes can catch things like dust, dirt, and pollen before they have a chance to hit the eyeball. They are the second line of defense after your eyebrows to keep sweat out of your eyes (sweat contains salt that can irritate the eyes). Eyelashes also help protect your eyes by filtering sunlight. And, last but not least, eyelashes act as a bit of a warning system for your eyes that something is too close. Similar to the whiskers on a cat, your eyelashes are pretty sensitive, and if something hits them, you know about it relatively quickly. This is meant to tell you to move your head or the irritant out of the way so it can’t damage your eyes. What Are the Causes of Madarosis? One of the main causes of madarosis is blepharitis, which is an inflammation of the eyelids. This inflammation can be caused by a number of infections (like staphylococcal aureus, leprosy, parasitic infections like Demodex folliculorum, viral infections like the measles, fungal infections like chlamydia), trauma, and allergies. In some chronic cases, lashes are lost when a person continues to rub their eyes because of the recurring irritation they’re experiencing. There is a psychiatric disorder called trichotillomania that causes the victim to pull hair anywhere from the body, which may also include eyelashes and eyebrows. There are a few autoimmune diseases that can cause madarosis. Alopecia totalis is an autoimmune disease that causes you to lose all of your body hair. Scleroderma and discoid lupus are two other autoimmune diseases that can have the madarosis as a symptom. While not incredibly common, growths along the eyelids such as cysts, tumors, or inflammations like chalazion (a noncancerous lump) can result in loss of eyelashes. Arsenic, bismuth, and thallium poisoning can all cause madarosis. Disorders of the thyroid gland like hypothyroidism and hyperthyroidism are known to cause eyelashes to fall out. There are a number of medications and medical treatments that may have the side effect falling eyelashes. These drugs can include anti-clotting medications, thyroid-balancing drugs, anti-cholesterol drugs, anti-clotting medications, and blood pressure medications. Chemotherapy can also cause eyelash loss. Now that you’ve got a better idea of the many causes of madarosis, you may want to know more about the symptoms of madarosis so you can recognize it if it occurs. The main symptom of madarosis is pretty much what you think it is: Your eyelashes fall out. That being said, there are a few other symptoms that often come along with it. Before they fall out, you may notice the eyelashes growng thinner and more brittle. Along with that, you may find that the eyelashes pull out more easily and aren’t as sensitive as you are used to. You may also find that when you are applying makeup like mascara, the eyelashes will easily be pulled out. This can sound pretty drastic, but there are a few eyelashes falling out treatments. Losing eyelashes can lead to some social anxiety due to the change it can make to your appearance. 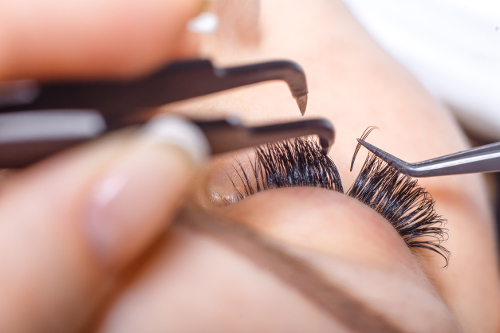 If madarosis begins to happen to you, it’s important to know what your options are when it comes to eyelashes falling out remedies. There are a few things you can do to help out your eyelashes. Increasing the amount of protein and fatty acids in your diet can help strengthen your eyelashes and promote regrowth. Be careful when using makeup. Make sure that the eye makeup isn’t old or crusty. When you are headed to bed, make sure to take off all eye makeup before you go to sleep. Don’t use fake eyelashes, or if you do, limit that use. All of these things can make eyelashes prime targets for madarosis. Biotin contains a number of nutrients that are useful for helping to repair skin, boosting your metabolism, and strengthening your hair and eyelashes. Borax can help clean out various infections and toxins that could be causing your eyelashes to fall out. You will have to slightly dilute the borax in order to use it for these purposes. Believe it or not, castor oil may be able to protect you against eyelash loss. Apply castor oil to the eyelids and the eyelash area. Castor oil will help encourage eyelash regrowth and as well as help to soothe the area from inflammation and infection. Beyond these remedies, one major thing you can do is treat the underlying cause of the madarosis. Once that cause is treated and cleared up, you may find that your eyelashes grow back. Madarosis May Be Disturbing, but Don’t Worry! Losing your eyelashes may be disconcerting. While they are not a major feature of your face, having no eyelashes can be noticeable—causing unwanted attention and, in turn, social anxiety. But the good news is that most of the causes of madarosis are easily treatable. When you treat the cause, for the most part, the eyelashes will grow back. In the meantime, there are a few home remedies that may help you regain your eyelashes. So, the next time you or someone else says, “My eyelashes are falling out!” don’t panic. While they are helpful, no one will die due to eyelash loss, and hopefully, they will grow back. “Get Facts On Importance of Eyelashes and Their Growth,” Consumer Health Digest, https://www.consumerhealthdigest.com/eyelash-care/importance-of-eyelashes.html, last accessed May 30, 2017. Saddison94, “Top 7 Reasons Why Your Eyelashes Fall Out,” Health Unlocked, https://healthunlocked.com/quitsupport/posts/130352027/top-7-reasons-why-your-eyelashes-fall-out, last accessed May 30, 2017. Begoun, P., “Madarosis,” The Cosmetics Cop, http://cosmeticscop.com/2016/08/22/madarosis-eyelash-loss/#lashloss, last accessed May 30, 2017. “What Is Madarosis? Its Causes, Associated Symptoms And Treatments,” Tandurust, July 13, 2012, http://www.tandurust.com/health-faq-8/madarosis-causes-symptoms.html, last accessed May 30, 2017. “Eyelash Loss Remedies,” Earth Clinic, https://www.earthclinic.com/cures/eyelash-loss.html, last accessed May 30, 2017. “Losing Your Eyebrows and Eyelashes?” Step to Health, https://steptohealth.com/losing-eyebrows-and-eyelashes-can/, last accessed May 30, 2017.